The Youngstown State University football team (1-1) squared off with Big-12 powerhouse West Virginia University (2-0) for the first time since 1938. 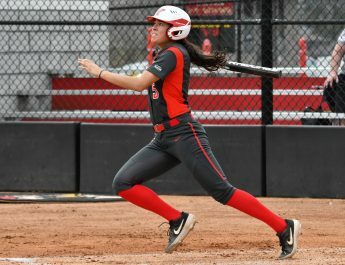 After coming off a big time win over Duquesne University last week, the Penguins had their hands full with the perennial Mountaineers. From the start of the game YSU went toe-to-toe with the Mountaineers. 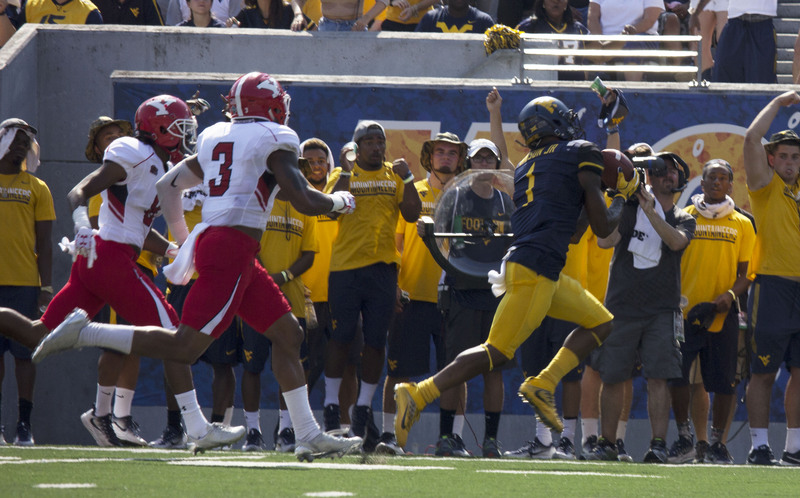 During WVU’s first drive, YSU defensive back Eric Thompson was able to come up with an interception from Mountaineers quarterback Skyler Howard. Throughout much of the first quarter both sides were able to put up a defensive front, making it difficult for either team to generate offense. But late in the first quarter Howard connected with wide receiver Ka’Raun White for a 53-yard pass, which put the first points on the board and gave WVU 7-0 lead. The Penguins were able to get points on the board early in the second quarter after running back Martin Ruiz punched in a one-yard touchdown on the goal line. 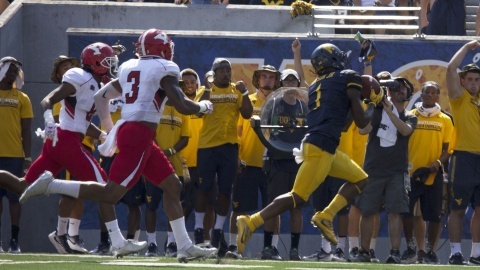 West Virginia University receiver Shelton Gibson (1) makes an over-the-shoulder catch behind two Youngstown State University defensive backs. up YSU’s first points of the game. The Penguins were able to add to their score after Davis connected up with wide receiver Alvin Bailey on a 74-yard touchdown pass, putting the Penguins up 14-7 over the Mountaineers. WVU continued to make the game a shootout through the air. Howard was able to link up with wide receiver Shelton Gibson on a 54-yard pass, tying the game up 14-14 late in the second quarter. The Mountaineers did most of their damage through the air during the first half, Howard passed for 228 yards completing 11of 19 passes. WVU put together a last second drive and had the opportunity of going up by three on the Penguins, but Mountaineers kicker Mike Molina missed a 30-yard kick far to the left. YSU had a tough time stopping WVU offensive attack, the mountaineers were able to produce 327 total yards of offense of YSU defense. After the first half, WVU put together another scoring drive in third quarter. Howard used his arm to find wide receiver Daikiel Shorts for an 11-yard pass, giving the Mountaineers the lead 21-14 over the Penguins, as YSU continued to struggle finding an answer for the Mountaineers. WVU began to key in on the Penguins defensive woes afterward. Howard was able to find Gibson for a second time on a 57-yard touchdown pass making the score 31-14 going in towards the end of the third quarter. Penguins backup quarterback Trent Hosick put a drive together on the ground, running for a 15-yard touchdown. Leaving the Penguins trailing WVU 31-21 in the fourth quarter. WVU was able to add one last touchdown in the fourth quarter, with Howard finding Kennedy McKoy on a 21-yard pass putting the final score at 38-21. The Penguins could not find a way to get anything going on offense for much of the second half, only producing an additional 185 total yards of offense from after halftime and scoring one touchdown. Also YSU faced an uphill battle on defense allowing Howard to throw for five touchdowns and 389 yards. The YSU Penguins showed up and competed the entire game! I like the this article. Go Penguins.